An antidote to dystopian and post apocalyptic fiction, this Cinderella story is sweet and hopeful. " The charming story is beautifully written, and the characters are well developed. West s novel is sweet and captivating." West s premise is a winner, and Addie is the kind of heroine readers would want as a best friend loyal, unpretentious, and thoughtful. What truly makes West s story memorable, however, is Addie s wry humor and the book s fascinating exploration of how life can change with one simple choice. " Oh the feels. This book was amazing. A fun and quick read that had me laughing and on the verge of crying in all the right moments. I felt like I could connect with Charlie because like her I'm somewhat of a tomboy and have gone through the stage of thinking guys won't like the real person underneath because of what society thinks a "normal girl" should be. This book really shows how as we grow up we come to realise that the people really worth your time will accept you how you are, whether you like different things or not. I loved the banter between Charlie, Braden and her brothers and I also loved seeing her discover herself and her friendships with other females in her life. Of course a big part of the storyline is also about her Mum passing away when she was just six, so this was the more serious and sad part of the book. I can't imagine what it would be like to grow up without having your Mum there, and Kasie West really wrote this well, shoving the emotion of particular moments right in your face. This book was fun, light-hearted and serious all in one. A quick read which I would definitely recommend. This is one of my favourite young adult romances. Charlie (Charlotte) is a Tom boy. She has three older brothers and her father is a cop. She not only grows into a young adult, but grows into a young woman. This added layer brings something refreshing to this coming of age story. Charlie is faced with a love triangle. But her relationships with the brothers, father and boss add a realness to the story that makes it so much more enjoyable than other books of this genre. The story is sweet and very much pg fun. I recommend this book to all young girls and women! 4.0 out of 5 starsA enjoyable read! I really liked this book but it is more for a YA audience so I felt it was a little juvenile at times but all in all, the writing was good, the characters were interesting especially Charlie's brothers. A fun, light read. This is a great neighbour love story with a twist. I loved the over protective brothers and wish I could have this kinda romance. West is an amazing author who writes convincingly and with passion. 4.0 out of 5 starsShort but sweet! For a fun contemporary romance, Kasie West is quickly cementing her place as one of my top go-to authors: interesting characters and stories that are like a warm hug. I liked how Charlie was an athlete - I was starting to get over alternative, quirky, coffee addicts that have been teeming YA of late. Also, the family dynamic of Charlie’s all-male family added a great dynamic, how the men in her life are protective of her whether she is aware of it or not; and how they rough-house with her as well. Her fathers, attempts at raising a daughter, while commendable, did come across as a little cliché, I was wondering where the doting father went – he was too stand-offish and left me wondering if he was a good father at all. But he manages to redeem himself in my eyes. Charlie was a good character to relate to, although at times I felt she was too immature, and her behaviour insulting to herself and her brothers (but sometimes her brothers deserved it.) There were also some trite moments that annoyed me, and I felt, did not need to be in the book. But I won’t talk about them here, because – spoilers! I did take a little issue with the fact how the book step up Charlie (and her missing a female role model as her mother passed away when she was young) in knowing little about fashion and make-up as somewhat deficient in being female. I did not see her as anything less, or nothing other than a strong female role model in herself. It rubbed against my sensibility that an interest in the superficial world of clothing and facial products has anything to do with being female or acceptance by other female peers. But with that said, it was cute and fun (politics aside). 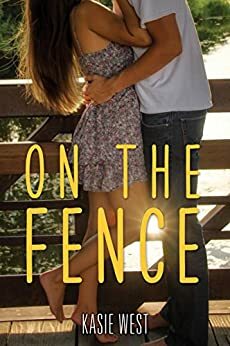 Braden was a sweet boy-next-door character, and again, very typical of this genre, but I liked his tenacity and acceptance of Charlie for who she is, without all the trappings of fashionable accessories. Some of the midnight conversations at the fence were touching, and others pointless and contrived. With such a poignant image defining the book, it would have been good that all these interactions were kept embodying the soul of the novel – as some of Charlie’s talks felt immature and irrelevant. But this is only a very small part (and my opinion), and the nocturnal blatherings are a fantastic part of the story and one of my favorites. I really enjoy Kasie West’s writing style, and have not come across a book of hers that I have not liked. They are luscious uncomplicated reads, yes predictable, but quick, well-paced guilty pleasures that don’t come off too kitsch.